The correct handling of a death from gunshot wounds begins at the scene. Here valuable evidence on the body can be lost or altered and bogus evidence may be inadvertently introduced through mishandling of the body. Before a body is touched, let alone examined, its position and appearance should be documented photographically and diagrammatically. The most important rule at the scene is to handle the body as little as possible so as not to dislodge trace evidence that may be clinging to garments or to the body surface. Hands should never be pried open, and fingerprints should never be taken at the scene. Prying the fingers apart may dislodge material such as fibers, hair, or gunpowder. Fingerprint ink can either mimic or obscure powder soot as well as introducing contaminating materials that may render subsequent examination of the hands for primer residues of questionable validity. Manipulation of the hands is of even greater potential danger if it is done by a police officer who, theoretically, can transfer primer residues from his hands to those of the deceased. After all, as part of the job, the officer handles and fires weapons, thus putting them in an environment where hands may be contaminated with primer residues. Before transportation of the body to the morgue, paper bags should be placed over the hands to prevent loss of trace evidence. Paper bags should be used rather than plastic, because condensation will form in the bags if the body is refrigerated. This can wash away primer residues and make fingerprinting more difficult. Some authorities claim that it is possible for the hands to be contaminated by barium from the paper bags, thus rendering analysis for this metal by flameless atomic absorption spectrophotometry (FAAS) invalid. In the author's experience, this has never happened. Once the paper bags are securely placed around the hands, the body should be wrapped in a white sheet or placed in a clean transport bag. This is done to prevent loss of trace evidence from the body. It also avoids transference of bogus evidence from the transport vehicle enroute to the morgue, as such a vehicle has probably transported numerous other bodies previously. On arrival at the morgue, the body should be logged in as to the deceased's name, the date and time of arrival, who transported it, and who received it. A case number should be assigned. At the time of the autopsy, an identification photo should be taken with the case number prominently displayed in the identification photo. If the deceased did not die immediately after being shot and was transported to a hospital, a number of surgical and medical procedures may have been carried out. Because of this, complete medical records of the deceased from the time of admission to the death should be obtained before the autopsy. All hospitals in the area served by the medical examiner system should be informed that in all medical examiner cases, no tubing should ever be removed from the body after death, e.g., endotracheal tubes, intravenous lines, or Foley catheters. Injection sites should be circled in ink by the hospital staff to indicate that they are of therapeutic origin and did not antedate hospitalization. Thoracotomy, laparotomy, and surgical stab wounds should be labeled or described in the medical records. If death occurs within a few hours after hospitalization, paper bags should be placed on the hands, just as if the death had occurred at the scene. The body and any clothing worn by the deceased should be transferred to the medical examiner's office. All medical records detailing the procedures performed should accompany the body. Any blood obtained on admission to the hospital should be obtained for toxicology. Admission blood obtained for transfusion purposes in trauma cases often is saved for one to two weeks in the hospital blood bank. The blood bank should be queried for retained initial blood samples. Before examination by the forensic pathologist, the body should not be undressed, washed, embalmed, or fingerprinted. Examination of the clothing is as much a part of the forensic autopsy as examination of the body. Embalming can induce artifacts, change the character of wounds, and make toxicological analyses impossible or extremely difficult. 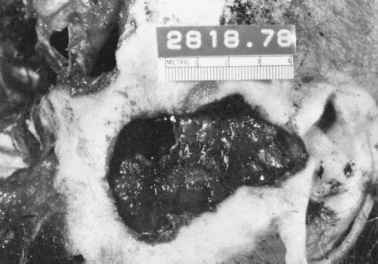 The best example of an artifact created by embalming is shown in Figure 13.1 The deceased was a young child who was allegedly accidentally shot by the father at a distance of 10 feet. The Justice of the Peace who initially handled the case saw no reason for an autopsy and had the body embalmed. When he changed his mind and the body was subsequently examined, there appeared to be a muzzle imprint in the left upper chest. This was in fact the outline of an embalming button that was used to "seal" the distant wound of entrance. During embalming, the tissue swelled around the button, producing the mark. 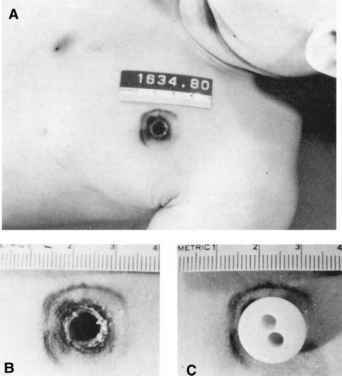 Figure 13.1 (A) Gunshot wound of left upper lateral chest; (B) circular mark around defect, suggestive of muzzle imprint; (C) embalming button in place, acting as causative factor for "imprint." After receipt of a body, the pathologist should have x-rays taken. X-rays should be taken in all gunshot wound cases whether the missile is believed to be in the body or to have exited. The clothing should not ordinarily be removed before x-ray. On occasion, bullets have exited the body and become lodged in or among the clothing. In one case the bullet exited the right chest and fell into the inside pocket of a jacket. A hole was present in the bottom of the pocket, and the bullet then fell into the lining. It would not have been found had x-ray not revealed it to be in the clothing. The next step is to recover any primer residue from the hands. This can be done by the use of swabs or lifts. At the same time, the hands should be examined for the presence of trace evidence, e.g., powder grains, fibers, hair, etc. Trace evidence should be retained and placed in properly labeled containers. Powder and soot may be found on the hand if the deceased had tried to reach for the weapon or had their hand around the weapon at the time of discharge. Fingernails may be clipped and retained at this time if indicated. After this procedure, fingerprints may be taken. It is suggested that at least two sets of prints be made, one for the police and the other for the autopsy file. In homicides, palm prints should also be taken. Next, the body is examined with the clothing still on it. Attention is paid as to whether the defects in the clothing correspond in location to wounds in the body. The clothing should be examined for the presence of powder, soot, and other trace evidence. Following this, the clothing is removed and laid out on a clean, dry surface. The clothing should not be cut from the body except under very unusual circumstances. The body is then examined without the clothing and without cleaning. One should search for trace evidence, powder grains, and soot. One may want to take photographs of the uncleaned wounds at this time. The body is then cleaned and re-examined for any other wounds that may have been concealed by dried blood. Photographs of the cleaned wounds may then be taken. The prosector should go back to the clothing and again correlate the observed entrances and exits with defects in the clothing. They should re-examine defects in the clothing for the presence of powder or soot. The use of a dissecting microscope is strongly recommended. Photographing of the wounds on the body is recommended. At least two photographs of each entrance wound should be taken. One should be a placement shot showing where the wound is in relationship to other body landmarks. The second should be a close-up showing the appearance of the wound. Most individuals take a third shot between the two extremes. It is helpful if there is a scale and the number of the case in the photograph. Each wound should be examined, and notes should be taken as to its exact location and appearance. Pertinent negatives should be noted. It is strongly recommended that the wounds be examined with a dissecting microscope. If there is any question as to range which cannot be settled at this time, the wound should be excised and retained for analysis by scanning electron microscope-energy dispersive x-ray (SEM-EDX) or energy dispersive x-ray (EDX). In routine gunshot wounds, it is not necessary to excise and retain entrance and exit sites. Microscopic sections of the entrance and exit do not ordinarily contribute any information that cannot be gained by examination with the naked eye or with a dissecting microscope. In some cases, microscopic sections may be misleading, especially to the novice. If powder, polyethylene filler, or fragments of the bullet are on the surface of the body, these should be retained and submitted with the bullet or pellets to the crime lab. In homicide cases, a complete autopsy involving the head, chest, and abdominal cavities should be performed. All viscera should be removed and examined. The track of the bullet should be followed and the point it lodges or exits measured in relationship to the entrance. If it is still present in the body, the bullet should be recovered. In shotgun cases, it is not necessary to recover all pellets but only a representative sample. Wadding should always be recovered. Wounds ordinarily should not be probed as they can create false wound tracks, distort a wound, or dislodge a missile. In all gunshot wound cases, blood, vitreous, urine, and bile, should be retained. In cases, of advanced decomposition where these materials are not present, muscle (from the thigh, preferably) should be retained. These materials can be used for toxicological or serological purposes.